Using a slightly larger jar, mix all the ingredients together. 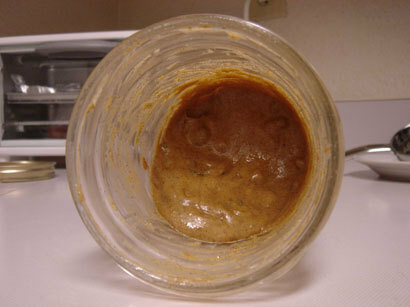 Alternatively, use an empty peanut butter jar and put half of the peanut butter into it and make 2 smaller batches. Using the second method will make it easier to stir from the bottom each time if the oil separates. I will definately be making this tonight. I just finished the last of my PB&Co Peanut Butter Raisin Swirl (delicious! but the raisins are always really hard), and was thinking I should make my own but didn’t know what combinations to use. I’ll let you know how I like it. Well, I made some. I had to add a bit more sugar and cinnamon than you have here, but it’s very, very tasty. Thanks for the idea! I’m making this as soon as my order from Nuttyguys.com comes!! I’ll also be making some almond butter and pecan butter! I did this but added 1tsp. of Vanilla and it was AMAZING. It the flavor even better it brought out the maximum flavor of both the cinnamon and the raisins. Oooh, nice addition! You’ll have to let me know – after it sits for a while, does the vanilla extract separate? If it’s a natural peanut butter, than the oil obviously will, but I wonder if the extract will along with it…. Hey Alyaa – Yup, just mix the ingredients together! The rest of the instructions just mention splitting 1 jar of plain peanut butter in half, and making 2 batches of Cinnamon Raisin PB. Doing so makes it easier to mix the ingredients together. Enjoy!